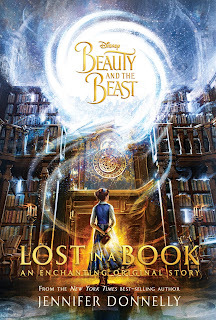 Beauty and the Beast: Lost in a Book by Jennifer Donnelly Givewaway! Thanks to Disney for providing me with a copy of Lost in a Book and Belle's Library as well as providing this prize pack! Are you excited for the Beauty and the Beast live action film? It has certainly been exciting to see many iconic scenes come to life. One of the things I always loved about Belle and the reason she's one of my personal favorites is that she's a bookworm! In celebration of this wonderful reality and the upcoming film, Disney Press is releasing several Beauty and the Beast books. I'm excited to offer a giveaway here! 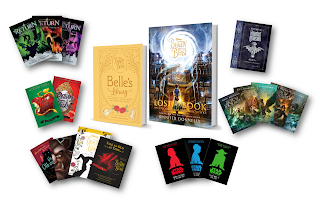 About the book: Smart, bookish Belle, a captive in the Beast's castle, has become accustomed to her new home and has befriended its inhabitants. When she comes upon Nevermore, an enchanted book unlike anything else she has seen in the castle, Belle finds herself pulled into its pages and transported to a world of glamour and intrigue. The adventures Belle has always imagined, the dreams she was forced to give up when she became a prisoner, seem within reach again. About the Author: Jennifer Donnelly is an award-winning, best-selling author of books for young adults and adults, including the Waterfire Saga: Deep Blue, Rogue Wave, Dark Tide, and Sea Spell. Her other young adult novels include These Shallow Graves, Revolution, and A Northern Light, winner of Britain's prestigious Carnegie Medal, the Los Angeles Times Book Prize for Young Adult Literature, and a Michael L. Printz Honor. She has also written Humble Pie, a picture book, and the adult novels The Tea Rose, The Winter Rose, and The Wild Rose. She lives in New York’s Hudson Valley. You can visit her at www.jenniferdonnelly.com, or on Facebook, Twitter, and Instagram @jenwritesbooks. Visit the official site for Lost in a Book to learn more about the book. You can also follow Disney Hyperionon Twitter to keep up with all the news about these books, as well as follow Disney Books on instagram for some extra visual bookish beauty in your life. Another great book included in this pack is Belle's Library which includes a lot of really great quotes in a beautiful little book. To enter, you must be a resident of the United States and fill out the following form. Entries must be received by March 17, 2017 at midnight EST. Winner will be notified via email.